The Purdue scientists, along with collaborators from the Smithsonian Institution and Johns Hopkins University, study the habits of earthworms originally brought to North America from Europe. 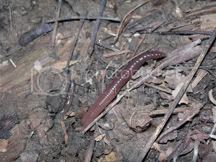 They want to determine the earthworms' effect on forest chemistry by comparing carbon composition in forests that vary in earthworm activity. Some earthworms eat fallen leaves and other plant material - the litter of the forest floor - while others eat roots or soil organic matter. This begins a decomposition process in which organic materials pass through the animals' digestive tracts and back into the soil. The earthworms that the team studies were brought to North America by early European colonists, probably in the ships' ballasts or in plant soil. In northern North American forests the settlers found land devoid of such creatures because the worms never reoccupied soils formed when the glaciers melted. In addition, earthworms don't move very fast. It's estimated they have migrated under their own power only about 100-200 kilometers in the past 10,000 years since the glaciers. In some areas of the forest, more than 350 worms can be found in one square meter. The impact of that many worms is huge for the forest ecosystem as from spring to fall they actively consume litter and mix it into the soil, leaving only a bare surface by year's end. Other members of the research team are Melissa McCormick and Dennis Whigham, both of the Smithsonian Environmental Research Center; Susan Crow of the Purdue Department of Earth and Atmospheric Sciences and now at Queen's University Belfast, UK; Katalin Szlavecz of the Johns Hopkins Department of Earth and Planetary Sciences; and Ronald van den Heuvel, formerly of the Smithsonian center and now at Landscape Ecology, Institute of Environmental Biology, Utrecht University, Netherlands. Both Johnston and Filley are members of the Purdue Climate Change Research Center. Timothy R. Filley, Melissa K. McCormick, Susan E. Crow, Katalin Szlavecz, Dennis F. Whigham, Cliff T. Johnston, and Ronald N. van den Heuvel, "Comparison of the Chemical Alteration Trajectory of Liriodendron Tulipifera L. Leaf Litter among Forests with Different Earthworm Abundance", J. Geophys. Res., 113, G01027, doi:10.1029/2007JG000542.